Summary: A charming, warmhearted novel from the author of the New York Times bestseller A Man Called Ove. I adored Fredrik Backman's debut novel A MAN CALLED OVE -- you can read my review here. It was quirky, yet touching, and the characters were just so memorable. So when I sat down to read his second novel MY GRANDMOTHER ASKED ME TO TELL YOU SHE'S SORRY, I had extremely high expectations.... maybe too high. Once again, I was entertained by Backman's quirky story and memorable characters; however, this book didn't have quite the same charm that A MAN CALLED OVE did for me. That being said, I did like it. MY GRANDMOTHER ASKED ME TO TELL YOU SHE'S SORRY tells the story of Elsa, a seven year old girl who is a little odd. Her best friend is her grandmother, who is seventy seven and maybe even more "odd" than her granddaughter. Elsa's grandmother has created a world of bedtime stories that take place in the Land-of-Almost-Awake and the Kingdom of Miamas, and she uses the characters in these stories to show Elsa that it's okay to be normal. Elsa is lost when her grandmother died, but her grandmother has left Elsa with an adventure and a bunch of letters. In these letters, Elsa's grandmother apologizes to those she offended during her lifetime. Elsa begins a quest to discover the letters and apologize on behalf of her grandmother to an assortment of "different" people. During this adventure, Elsa gets to truly know the various tenants in her apartment building, and she also learns that these bedtime stories have more truth in them than she ever realized. First let me start by saying that I appreciated that MY GRANDMOTHER ASKED ME TO TELL YOU SHE'S SORRY wasn't really like anything I've ever read. I love how unique the story and the characters are, but I admit the description of the book made me wonder if I would enjoy the book. I'm not one for fantasy or make-believe, and I was hoping that there wouldn't be too much of the grandmother's stories. Unfortunately, I think that was part of the problem for me with this novel -- there were a lot of bedtime stories. I understand what the author was doing with the stories, and I did appreciate how everything eventually came together, but it took awhile for me to get there. One terrific thing about MY GRANDMOTHER ASKED ME TO TELL YOU SHE'S SORRY was how the author managed to create so many unique characters. It all started with Elsa. She was definitely different than most seven year kids, and my heart did go out to her because she didn't have a lot of friends. I loved that her best friend was her unusual grandmother (who was another wonderful character! ), and my heart was broken when Elsa's grandmother died. Elsa's parents were divorced, and her mom was not only a workaholic, but also pregnant, so Elsa was more than a little lost without her grandma. As each of the special characters who lived in the same apartment building as Elsa were introduced in the novel, I began to see where this story was going. I truly did appreciate how the author tied the adventures in the Land-of-Almost-Awake with the real-life stories of her friends. What I found so interesting about my personal "reading experience" was how my feelings changed about each of these "misfits" (probably not the right word, but you get the gist!) I initially judged them based on their unique behavior, but as their past stories were revealed, I saw them very differently. I became less judgy and more compassionate to them. I enjoyed that this book made me see things differently, and I hope I can translate that to my real world! 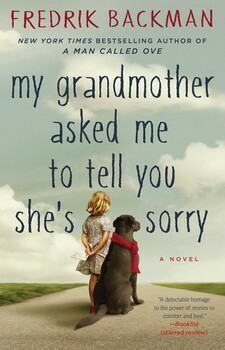 I do think MY GRANDMOTHER ASKED ME TO TELL YOU SHE'S SORRY would make a great book club selection. There is a reading guide with thirteen thought-provoking questions and some ideas for ways to enhance your book club meeting. Some of the themes you might want to explore include heroes, love, loss, grief, forgiveness, redemption, stories, grandparent/parent/child relationships, marriage, friendship, and sacrifice. Overall, I'm definitely glad that I read MY GRANDMOTHER ASKED ME TO TELL YOU SHE'S SORRY. It's an entertaining story that is also sweet and unique -- just like the characters. Recommended to current fans of Mr. Backman's and readers who enjoy quirky stories. He does write fabulous characters. I'm looking forward to this book!